Hey, look! Another Toucan ink from Anderson Pens! This time we have a light purple ink that fits well with, I don't know...Valentine's Day? It's a bit pale for me, and it's a bit purple for me to use regularly. I used this in a really medium-flow medium nib, and it was kinda pale. Like most of the rest of this collection, it's not really all that saturated, but judging by the swatch and the swab on the Anderson Pens site this might be a good bit darker if you used it in a wet nib. I actually don't know why there's a bit of orange in the first couple of strokes of that "T". There hasn't been an orange ink in that pen for a while, and there's no orange in the ink that I can see. MYSTERY. 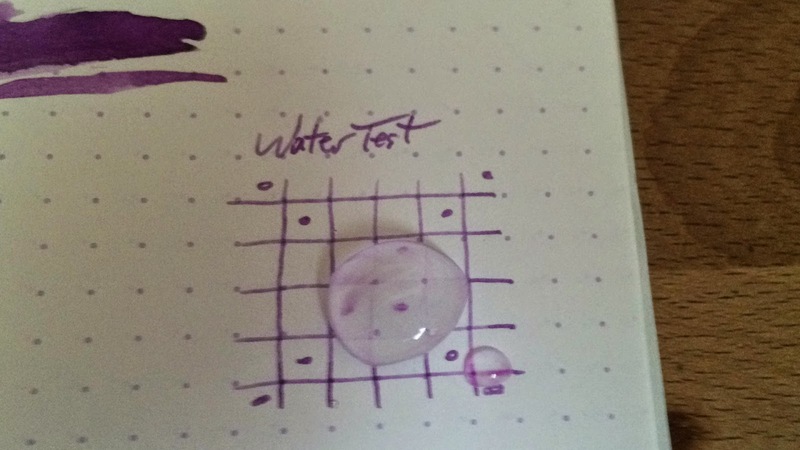 I've dipped a couple of these purple inks to compare to Violet. I think I like the Jane Austen a bit better than Violet, but that's probably just because it's darker. I'd be more likely to use Deep Purple, though. Yep, that's a cat walking around behind my chromatography. Her name is Katy Purry. Toucan's Violet is a fairly light purple ink. It's well behaved, and it's bound to find fans out there. You can (only) find bags and samples over at Anderson Pens. A 60ml bag goes for $10. There's a fun hashtag on Instagram right now (#killwinterwithorange), and this ink fits right in with that theme. The idea is that winter is a dreary time of year, and orange is the cure. I'm down with this. Toucan's Orange is a really solid ink. It's saturated enough to use regularly, and it doesn't have any problems on copy paper. I was using this ink in an orange pen (this Artista Crystal), and that's a little weird for me. I'm just not into matching pens and inks. Another odd thing about this match is that I bent my Artista's nib, so I have a Franklin-Christoph nib in there. It wasn't working all that well, but I think that's because the feeds are different, so I won't hold that against this ink. I had some hard starts, but it flows just fine once it starts. I'm pretty sure it was a nib issue. 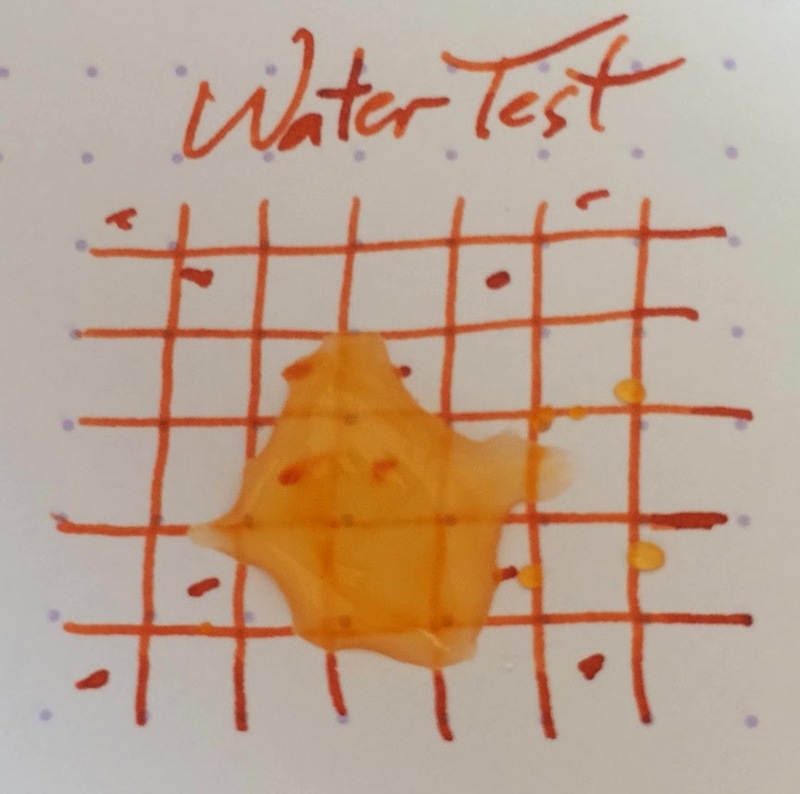 Check it out below, and get yourself a bag of this orange beauty exclusively from Anderson Pens (who graciously sent this ink out for review). Here's a close-up of those colors I thought they looked nice together. It's a bit like the Blazing Sunset ink from last time, but it doesn't have the shading or the bleeding issues of Blazing Sunset. Probably better all-around. Water resistance? I don't predict much of that from this ink. I'll include a comparison of these two inks on copy paper. One definitely behaves better. Toucan's Orange is a solid orange ink. It's got some good saturation, and the color is bright and summery. You can (only) find bags and samples over at Anderson Pens. A 60ml bag goes for $10. This is just a quick note to draw your attention to a kickstarter that needs a little help. Linda Shrewsbury contacted me a little while ago to see if I would be interested in checking out her cursive-teaching system. I've been feeling, lately, that my handwriting needs a little help so I said "sure!" The handbook that she sent out is very well-done. It's printed high-quality paper with a decent spiral binding. Holding this book really brings me back to my primary school days when we had lots of these type of workbooks. The print inside is glossy and crisp. Good lookin' work. The system that Linda has developed is one which aims to teach cursive writing in a more sensible way than the standard "write this one letter a hundred times" fashion that I remember from school. That wasn't fun, and I always remember resenting it. I couldn't wait until I didn't have to do that dumb practicing any more. Linda's system has broken the alphabet down into four different letter-shapes: oval, loop, swing, and mound. The similarly-shaped letters are taught together, then connections between different kinds of letters, then writing your name, and then upper case letters. Throughout, the book shows what sorts of motions to make in drawing the letters, and that's a very helpful feature. It's a pretty tight system, I think, and much better than the methods I remember using back in primary. Head over to Kickstarter to lend your support and get this project really moving. They're a little short of their goal, and there are only a few days left, so get over there if you're interested. Here's a snapshot of what you'll learn below. This is a great color, but you'll need decent paper to use it well. It shades like mad, but it also bleeds through average papers. The closest thing that I have to this in a pen right now is Toucan's Orange, and it's not super-close. This is an ink that makes me think of fall leaves and Texas sunsets. It's a perfect ink for the winter, if you're feeling a little S.A.D. Here's another really short time-lapse video of the chromatography. This is really the only issue with Blazing Sunset. It feathers, spreads, and bleeds when you put it on copy papers. Keep it on decent-to-premium papers and it will perform really well. So, if you're in the market for a good lookin' orange ink, and you use mostly high-quality papers, then this is an ink that you should definitely check out. I don't know if you can get this ink in samples anywhere, but you can get these in 50ml inkwell bottles for $12 from Levenger's website. If you'd like to help support Inkdependence, then head over to this link to find out how you can help. I uploaded these pictures and the video a couple of days back, got distracted, and thought that I'd posted the blog. Well, I didn't. Now I have. Hooray! Firstly, Royal Blue is kinda misnamed. I think of dark blues when I think of "royal blue" and that's not what this is. This ink is a light blue with very little saturation. It's an interesting blue, but it's too light for me. There is a sort of brightness to the ink, but it's not doing it for me all by itself. The good news is that these inks (available only through Anderson Pens) are mixible. A drop or two of a cool green or something would really perk this ink up, I think. There are a couple of blues in this set, and they're all more saturated than Royal Blue. It's brighter, but they're more blue. This chromatography has a couple more hues than the rest of the set does, with purple undertones and the main blue color. This ink is a good value, and it has really good features. It flows well and there aren't any issues on the copy paper. It actually might look a bit better on the copy paper because it soaks in a bit more. You can (only) find bags and samples over at Anderson Pens. A 60ml bag goes for $10. Toucan's Black is the most saturated of the inks in this line, and that's probably a good thing. These are, firstly, mixing inks and I imagine that a set like this needs a good solid black to add into the rest of the colors. This is a medium black, but I can't imagine that you're going to get any results from adding the other colors to this one. They're all a lot less saturated. You might get some interesting results from adding this to the other colors, though. Black (not a great name, really) has excellent behavior, and it flows well. It's not the darkest black, but it's certainly a good one. Compared to the Boston Brahmin, Toucan's Black is a light-black. That's a really dark black, though (at least as black as Aurora), and you're not going to notice (much) that Toucan's is lighter unless they're side-by-side. This ink is a good value, and it has really good features. It's a fine black ink, and it flows well. You can (only) find bags and samples over at Anderson Pens. A 60ml bag goes for $10.